Start your review of Bryan Swanson. Send a message to Bryan Swanson. Thank You! Your message has been sent to Bryan Swanson at Cam Clark Ford Airdrie. I purchased a used truck from Bryan and was very pleased with my purchase and particularity happy with the service I received from Cam Clark after the purchase. There were some minor issues with the vehicle and they were very accommodating in terms of getting the issue addressed. Exceptional customer focus. Thanks Bryan and team! Other Employees Tagged: Laurin was awesome as well! This was my second time buying a vehicle and it was the most stress free & amazing experience. I felt no pressure at all! Bryan took a well amount of time to sit down with me and go through different options to get extactly what was best for me. The excitment and love he has for the Ford dealerships that he has worked for, and Ford in general, truly shows, i felt like i was a part of a new family. I definitely appreciate all the time taken to show me vehicles and find the right numbers for me. Kristine was amazing very informative and caring for who i was as an individual. I definitely appreciate all her hard work in making sure i was able to drive off the lot ready with little hassle. Everything was done for me there! i could leave safely with all my paper work. Super stressed free ! They are both amazing and intelligent people who care for YOU. Would recommend to anyone especially my close loved ones. 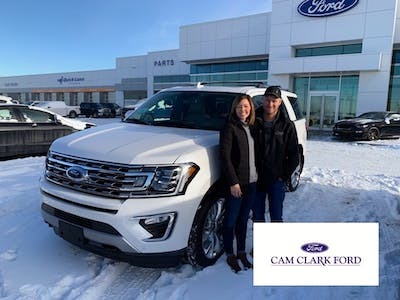 This was our first time dealing at Cam Clark Ford but it won’t be the last. Our salesman Bryan was very prompt in replying to our inquiries, no matter time of day it was. Purchased vehicle over the phone and when we arrived to pick it up everything was as he said it would be. I want to thank Bryan and Cam Clark Ford for an amazing experience. Bryan was open, straightforward and made me feel heard. He treated me with respect and integrity in that, he did what he said he would and he went above and beyond. Thanks again. "Willing to solve problems "
It was a slow and challenging start with the finance department, however the sales rep Bryan really stepped up in the end and made sure this was all fixed. He went above and beyond making sure the vehicle I wanted would work out! I'm happy to say I am now getting the vehicle I need and am excited to finalize things this week! Got my vehicle today ! Very happy with every effort Bryan put in and the new finance woman I dealt with! "Best sales experience I’ve had!" Bryan Swanson of Cam Clark was incredable. After months of truck shopping and dealing with various dealerships and sales, Swanson nailed it! He got me into exactly what I wanted with a price that beat anything I had even considered by a long shot. "Fantastic service from Bryan Swanson!!" Was my first time buying and veichle and Bryan was who I was recommended. He took the time to find a truck that was right for my budget and wasn't shy to any question I had to ask. I had an ideal of what kind of truck I wanted and he double my expectations. Would and will be recommending to anyone in need of a vehicle. After dealing with less desirable Ford dealerships, I went to Cam Clark. I bought a car from Bryan and have gone back and bought two more from him since. He is friendly and honest and makes the whole experience relaxing, fun, and stress free. I’ll be back for the next purchase also!